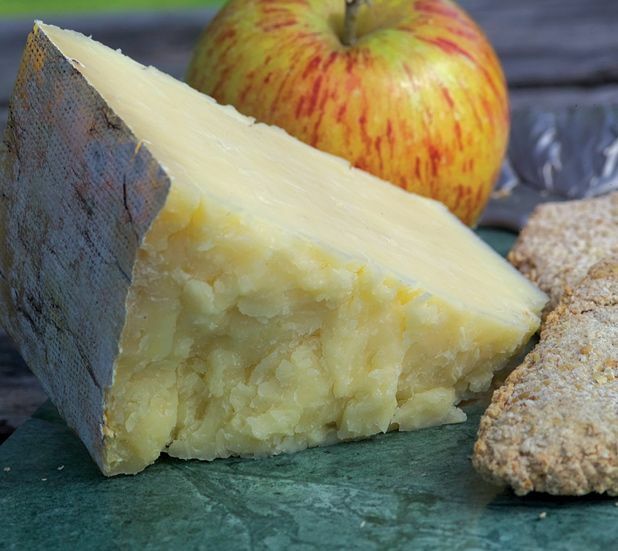 Scotland’s equivalent of Cheddar is enjoying a revival thanks to a number of artisan makers. Jackie Hunter looks at the story of Ayrshire’s Dunlop. Scotland doesn’t produce many hard cheese varieties, but Dunlop is one that dates back to the 17th century, when farmer’s wife Barbara Gilmour pioneered a process using unskimmed – or ‘sweet’ – milk from the Ayrshire cows at Hill Farm. Her method produced a distinctly creamy texture and mellow, nutty taste and was so widely copied that Dunlop soon became Scotland’s equivalent of cheddar. It all but vanished in the mid 20th century owing to dairy-industry consolidation, but a quiet revival began two decades ago and is now blossoming as farmhouse cheeses, rather than mass-produced varieties, become increasingly sought after. ‘We moved here in 1985 and opened up the dairy,’ says Ann Dorward, of West Clerkland Farm in Ayrshire. ‘Because we’re only a mile from Dunlop village, it seemed obvious that Dunlop cheese was what we should make.’ Although she follows the Gilmour method there is no actual recipe in existence, Ann points out. ‘The cheese’s characteristics depend purely on the grasslands where the cattle graze, the local climate and the weather. The area is what makes it unique and that’s why we applied for PDO [Protected Destination of Origin] status four years ago. If it’s ever granted we’ll have to give our cheese a new name, because Dunlop has become a generic term – it can be made anywhere.’ The Dorwards are presently the only Dunlop producers in Ayrshire, so a PDO status now would be theirs alone.